These muffins are healthy and delicious. Yields 36 muffins, definitely worth the effort. Preheat oven to 350 degrees. Prepare muffin tins by rubbing insides with oil-dipped paper towel. Using a stand mixer or large bowl, mix flour, oatmeal, flaxseed meal, baking powder, cinnamon, and sugars until fully combined. Mix in applesauce, vanilla extract, butter, and almond milk until all ingredients are well combined. Gently fold in bananas. Scoop batter into prepared muffin tins with 1/4 cup measuring cup. When all muffins tins are full, distribute blueberries evenly, and push some blueberries down into the batter, leaving a few a the top. Peel the third banana and slice as thin as possible. 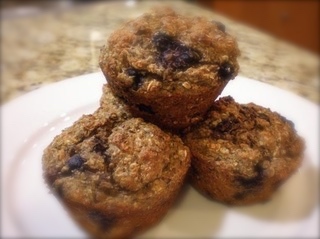 Place 2 to 3 slices of banana on each muffin, then sprinkle the tops with just a pinch of brown sugar. Bake for 20 to 25 minutes or until toothpick comes out clean. Baked muffins are good for 3 days, covered and unrefrigerated. If freezing baked muffins, wait until completely cool then bag them or use a plastic container with tight-fitting lid. Raw batter can be frozen or refrigerated for later use — place in resealable plastic bag and lay flat, rather than in a large block, for easier defrosting.